Reversed Image Search: No Keywords Any More! Tineye.com is a new online service allowing for reversed image search: unlike all existing image search engines it searches based not on keywords you submit but on images you upload. 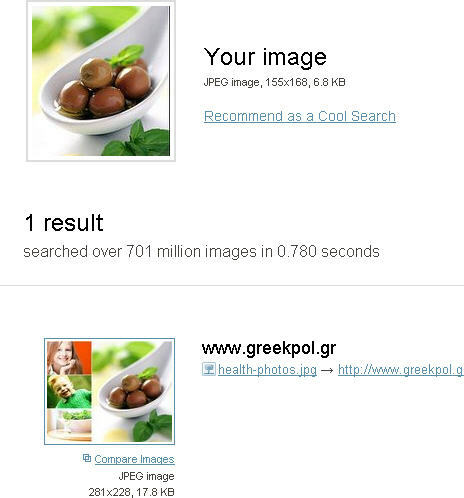 The process is amazingly simple: you upload an image and the system finds similar ones available on the web. The site admits their database is small already but out of 7 images I uploaded, they found 2 and were accurate and correct. I guess, this is a huge step forward to a new era of search. Soon it will be much easier to look for people infringing your copyrights and using your images.